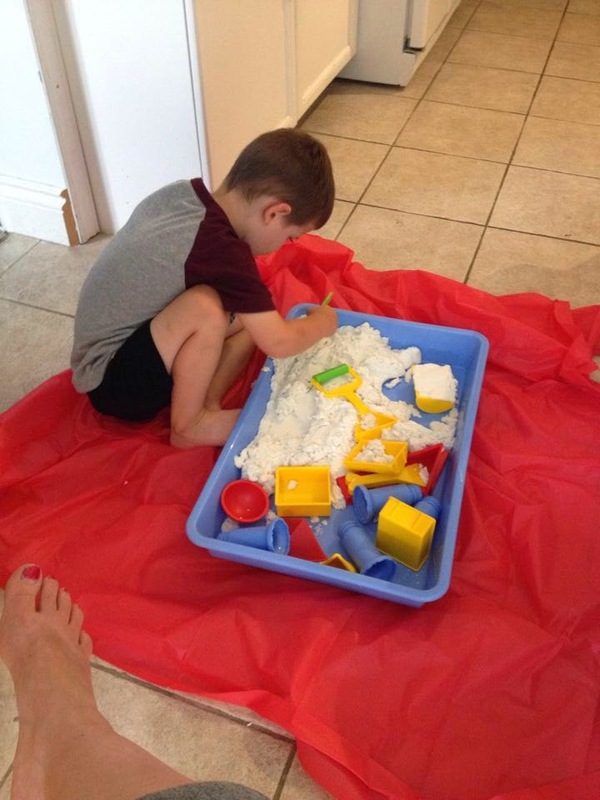 I am always on the hunt for things that can keep the kids occupied indoors if needed (super humid days, thunderstorms etc). When I was contacted to review Sands Alive! I knew I had to give it a chance with the kids. These natural, non toxic and organic ingredients create a compound agent that binds together to create an environment in which it is not physically possible for bacteria to grow! When it arrived, the kids were super anxious to get their hands on it. After reading the box, it seemed that it needed 12-24 hours of open air before it would be optimal to play with. 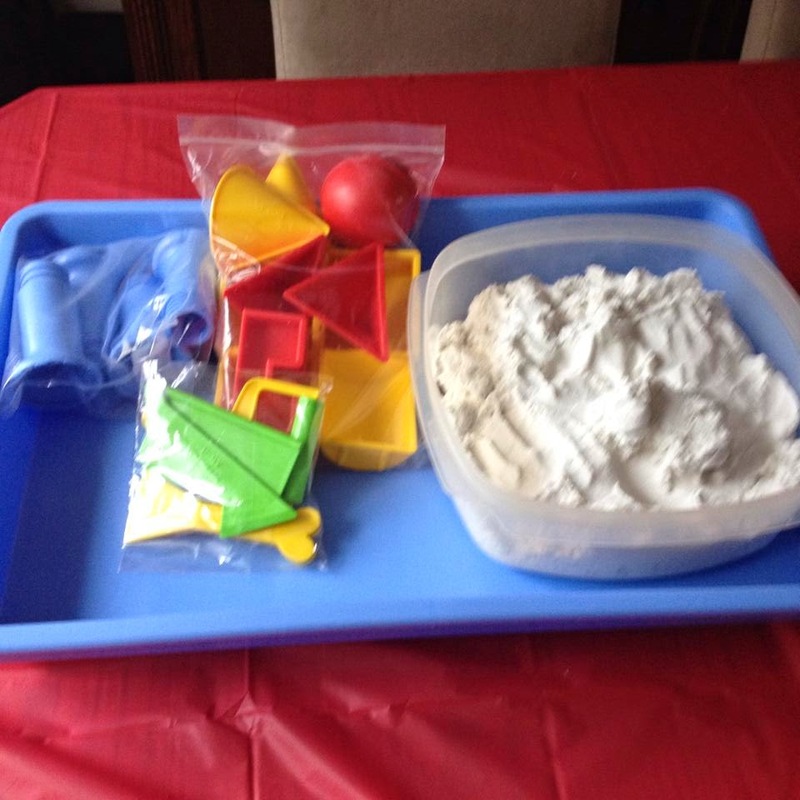 I opened the box, took the sand out of the bag it comes in and left it on our dining room table until the next day. When I gave them the go ahead, they went nuts. I had a plastic tablecloth on the table under the tray that it came in to try and catch any messes, but it still ended up on my carpet. Definitely have a tarp or sheet or something large underneath to catch any spills - or use it outside. It's been 3 days now, and it is still as fresh as it was when I opened it - and it has not been covered! There are many different sets available, and the price ranges from $23.99 up to $79.99 (which is the set we received). To stay up to date, connect with Sands Alive! on Facebook. Tales of Mommyhood is offering a giveaway for one of our lucky readers. 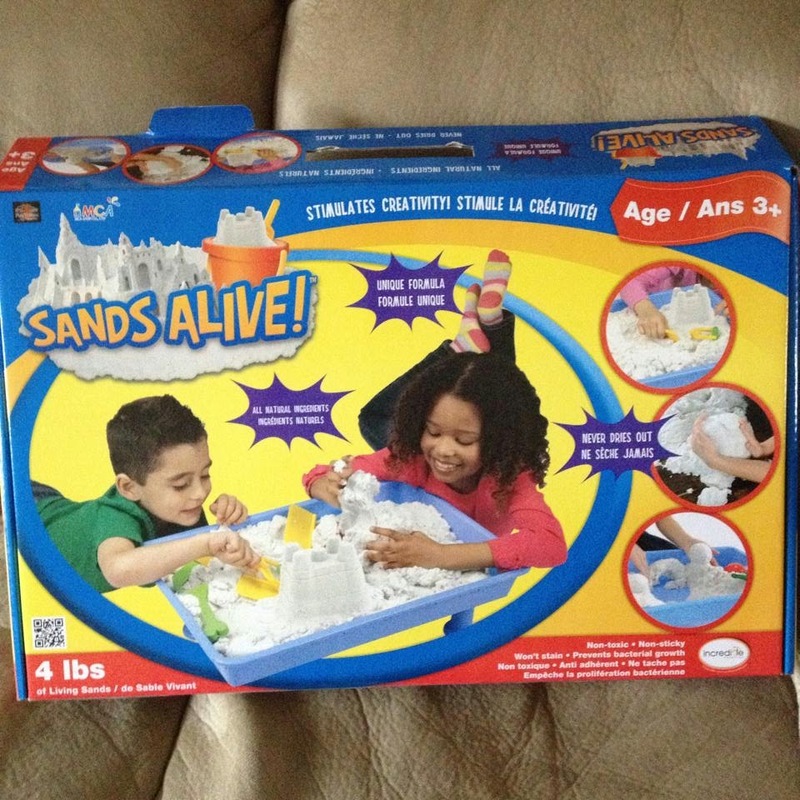 Use the form below and enter for your chance to win a Sands Alive! kit of your own (may be different than the one shown above). Open to Canadian residents only and ends at 1159pm EST July 28 2014. Make sure to complete BOTH of the mandatory entries to qualify. I would love to win this for my kids. They would have a blast! I would like to win for my youngest 3 sons. They are 4, 5 and 6 (well, 7 as of Monday). I want to win this for my 2 boys! My son really wants this! My little guys love Sands Alive! I would love to win this for my 8 year old Miss K.
My 3 kids would love this. I'd love to win this for my friend's little boy. This would be awesome to win for my granddaughter, the fun that can be had with this!! I would win this for my almost-four yr old daughter. She would love it! My kids would love to play with this - anything to be creative and a little wild. I want to win this for my nieces and nephews, they would have a blast with it! 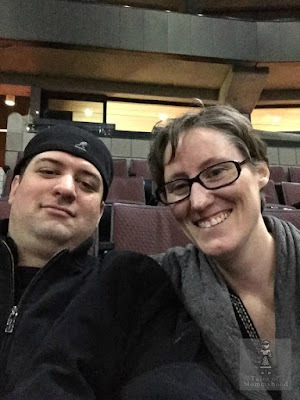 I want to win it for my sister's son! My daughter would love this and my son would get a kick out of it as well. I would live to win this for my little boy !! I want to win this for my child who is a toddler! For the grandkids when they come to visit! I would love to win this for my boys aged 7 & 5!! They would love it! Thanks! I'd love to win this for my daughter. She's played with it at a friends house and really liked it. I would want to win this for my 2 year old son. I want to win this for my kindergarten students. Bailey Dexter I would love to win this for my better half's grandson! I would love to win this for by BFF's son! I would like to win this for my kids. And me! I saw this at Michael's and it felt cool. 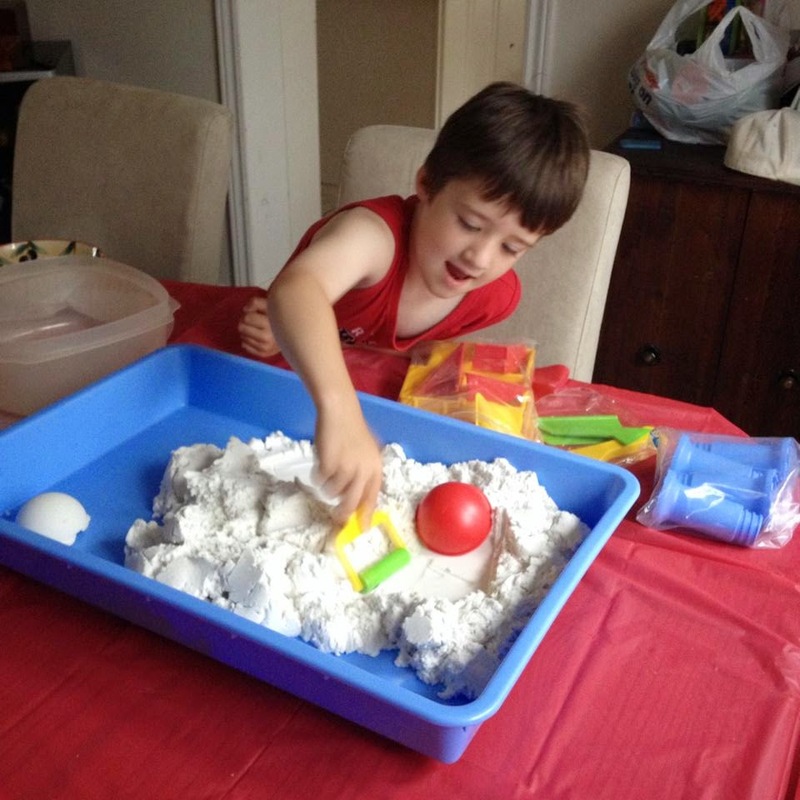 Would be great to bring the sandbox indoors. I would love to win this for my son. He plays with it whenever we are at Chapters and loves it. I would love to win this for my son and daughter. They would really really love it! I'd love to win this for my nieces! This would be for my daughter Little Miss R!